light and dark in my pieces and I strive to couple these with stimulating and sometimes disturbing themes. I also want my pieces to invite the outstretched hand to enhance the experience the viewer shares with my art. I prefer to work in stone as a direct carver and use marble, limestone, soapstone and alabaster. Date of Birth: July 21, 1942. Place of Birth: New York City, New York. Plastic Surgery Residence, Norfolk VA, 1984-86. General Surgery Residence, U.S. Navy, Portsmouth VA, 1974-79. George Washington University Medical School, 1970-74. 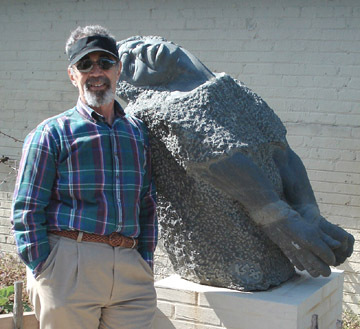 Instructor in stone carving, Passionate Stone Studio, Staunton VA 2004-present. Sculpture Symposium, Brookgreen Gardens SC, September 2002. Instructor in stone carving, Brookgreen Gardens, SC 1997-2000. Workshop in Terracotta by Marion Roller, Brookgreen Gardens SC, January 2000. Annual Exhibition, New York NY October 1999. Workshop in Relief Sculpture with Eugene Daub, Loveland CO May 1999. Artida Studio with Jill Burkee and Giancarlo Biage, Pietro Santa Italy, August 1995. Scholarship Award, Romcyn Atelia with Tom Schomberg, Evergreen CO, August 1994. Workshop with Greg Wyatt, Brookgreen Gardens SC, August 1994. Artida Studio with Jill Burkee and Giancarlo Biage, New York NY, March 1994. Workshop with Jill Burkee at Montoya Studios, West Palm Beach FL, March 1993. Montoya Studio Workshop, West Palm Beach FL, December 1992. Plastic Surgeon, Myrtle Beach SC, 1986-98. General Surgeon, U.S. Navy, Naval Hospital Puerto Rice, Portsmouth VA 1979-83. Medical Illustrator, University of Miami Medical School, Miami FL 1967 - 1969. Medical Illustrator, U.S. Navy, Washington DC 1964 - 65. Completed Medical Illustration School, U.S. Navy, Washington DC 1963. One-man show, Burroughs & Chapin Museum, Myrtle Beach SC, July 1998. Annual Exhibit, National Sculpture Society, New York City, December 1997. Group Show, Contemporary Sculpture at Chesterwood '97, Stockbridge MA, July 1997. Group Show, Myrtle Beach International Airport, Myrtle Beach SC, April 1997. Group Show, Sculpture in the Park, Loveland CO, August 1996. "Fresh Air" Exhibit, National Sculpture Society, New York City, February 1996. Group Show, Waterfront Gallery, Charleston SC, June - October 1995. Two Man Show, Collectors Cafe, Myrtle Beach SC, November 1994. Exhibit, Cane Island Decoy Gallery, Myrtle Beach SC, November 1994. Three Man Show, The Design Center, Myrtle Beach SC, April 1993. The Second Annual Florida Outdoor Sculpture Competition, Lakeland FL, April 2002 - February 2003. Best in Show, Waccamaw Arts & Crafts Guild Juried Show, Myrtle Beach SC, March 2002. First Prize, Three Dimensional Work, 31st WACG Judged Show, Myrtle Beach SC 2000. Best in Show, WACG Juried Show, Myrtle Beach SC, March 1999. Artist of the Year, Horry Cultural Arts Commission, Conway SC, 1998. Michaux-Sturgis Award, 12th annual Sculpture Celebration, Lenoir NC, 1997. 11th Annual Rosen Exhibit, Appalachian State Univ., Boone NC, 1997. Patron Award, 27th Waccamaw Arts & Crafts Guild Show, Myrtle Beach SC, 1996. Certificate of Merit, Sculpture Celebration, Lenoir NC 1994. First Prize, Professional Class in Sculpture at 25th WACG Exhibit, 1994. First Prize, Professional Class in Sculpture at 24th WACG Exhibit, 1993. Second Prize, Professional Class in Sculpture at 23rd WACG Exhibit, 1992. Third Prize, Professional Class in Sculpture at 21st WACG Exhibit, 1990. Alexandra Stevens gallery of fine art, Santa Fe, N.M.
Acquisition of Freedom's A Comin' by Brookgreen Gardens, SC January 2000. Life-size Outdoor Bronze Elan for Strand Regional Medical Specialty, 1997-98. Life-size Outdoor Bronze Deprivation for Strand Regional Medical Specialty, 1996-97. Restoration of Manship's Griffin at Brookgreen Gardens SC.